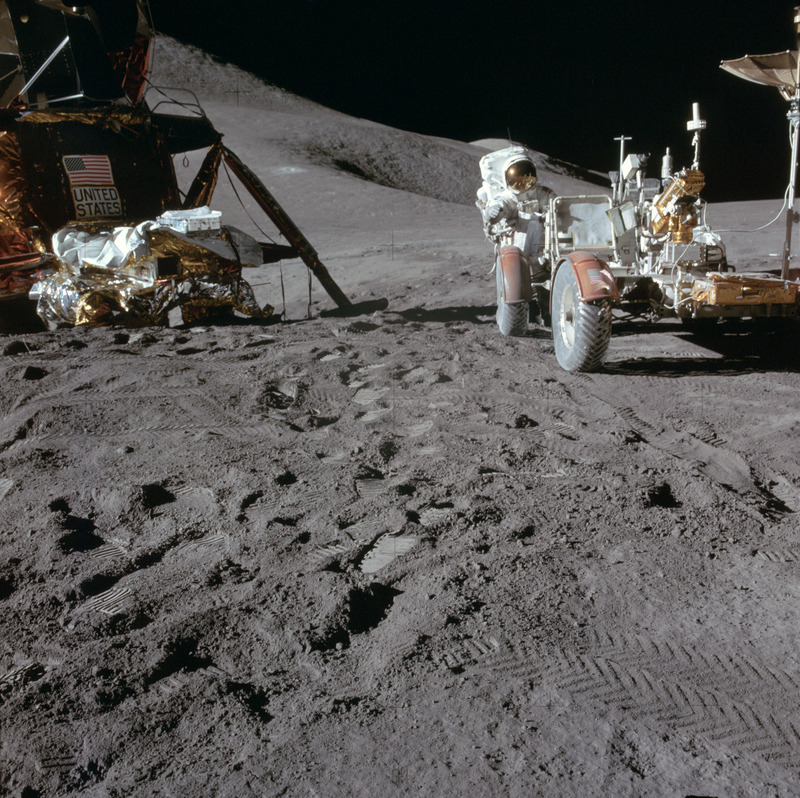 Photographs taken on the lunar surface during the Apollo missions are regarded as the most compelling pieces of evidence that mankind went to the Moon. The photographic validation method presented here is based on the detection of two-dimensional objects among three-dimensional objects, and determining the mutual arrangement of these objects in space and the distance to them by applying a technique known as stereoscopic parallax. The word parallax derives from the Greek parallaxis meaning "alteration" where parallax is the difference in the apparent position of objects caused by shifting camera position. To achieve such a result, images are overlapped and are deducted/subtracted from each other using the function "difference" in an image processing application such as Photoshop®. Optical transformations are used when images are subtracted. During image convergence simple operations are applied: x and y axis scaling, rotation and distortion plus two additional processes: perspective and shift. Such processes are referred to below as "optical transformations". Objects further than two kilometres distant, with a minor camera shift, have zero parallax. Two overlapping images are placed on different layers – thereby creating a PSD file. Application of function "difference" to the upper layer (subtraction of images from each other). Optical transformations are applied: axes x and y scaling, rotation, distortion, perspective and in addition a shift to the requirement specified above. As a result maximum density black for the background is obtained. The layer is returned to the normal view: function "normal". The PSD file is pruned to remove non-overlapping parts. Sequentially, the converted layers are carried over into the application’s GIF animator. A stereoscopic GIF image is obtained that permits the creation of a 3D effect, even on a flat screen. If any given image was taken inside a pavilion or dome with a panoramic background, i.e. when there are no distant objects with null parallax, then such a 2-dimensional object can be detected among any 3D bodies. In the case of such a finding, reaching the conclusion that there was deception could be stated with confidence. Example 1. The method of creating a stereoscopic image is examined in the following example of images of the Zmievskaya power plant, Kharkov region, Ukraine. The camera shift is 1.5 m.
Fig. 2. The Zmievskaya power plant Kharkov region Ukraine. HiRes image 1, HiRes image 2. The distance to the power plant is about 4 kms and to the tree planting (left horizon) is about 2 kms. The image convergence shown below (the main criteria is the most complete background subtraction, and since the distance is more than 3 kms, the parallax is zero). Fig. 4. Stereoscopic image of the Zmievskaya power plant. (For more detailed information on creating stereoscopic images and obtaining intermediate images see this article – in Russian). Knowing the distance to the front edge: 5 m, and the front edge offset: 85 mm (can be measured by a ruler, the two white grasses), plus the offset of the nearest electric pylon, about 1.2 mm. From the proportions ratio the distance to the nearer pylon is acquired, namely 350 metres; to the second pylon with the parallax of 0.6 mm is 700 metres. Distance to the trees (offset is about 0.2 mm) is close to 2 kms – at the boundary of parallax occurrence. Conclusion: These simple image transformation operations preserve perspective proportions. Similarly, as in the case of examining the parallax of the Apollo lunar surface images – where, according to NASA maps of the landing sites, the distance to the mountain background should be more than 5 kms – evidence of stereoscopic imagery is expected. If such evidence is absent, the image cannot have been taken in the stated environment, such a image must have been created elsewhere in a studio. Having looked at stereoscopic parallax in images of terrestrial objects, some Apollo images are studied from the photographic record. 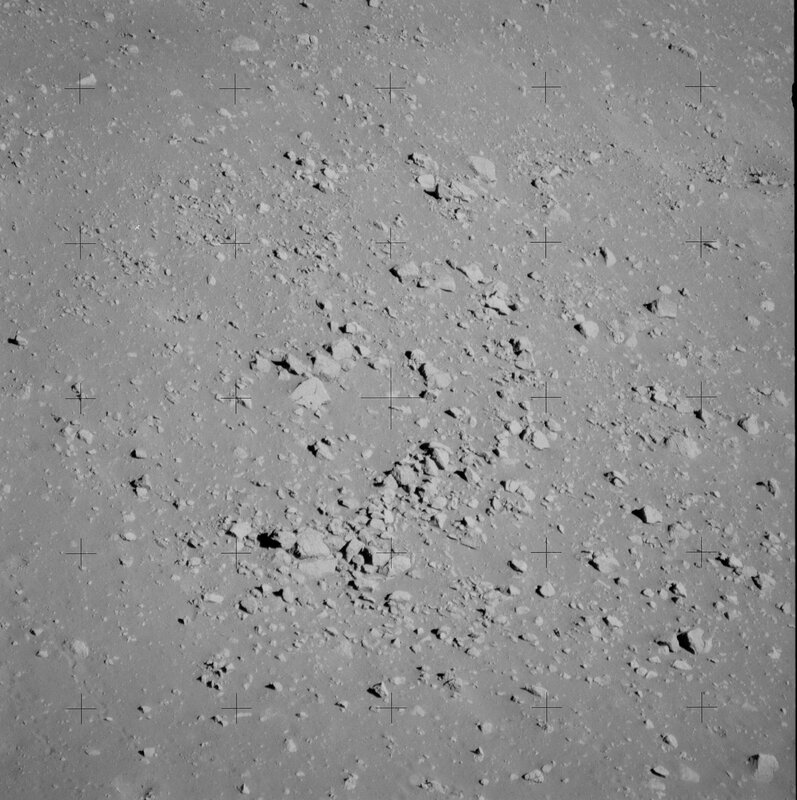 The Apollo 15 LM touched down at 22:16:29 UTC on July 30 1971 at Hadley (26°7'55.99"N 3°38'1.90"E), near Hadley Rille (also referred to as Rima Hadley), Montes Apenninus and Mons Hadley. 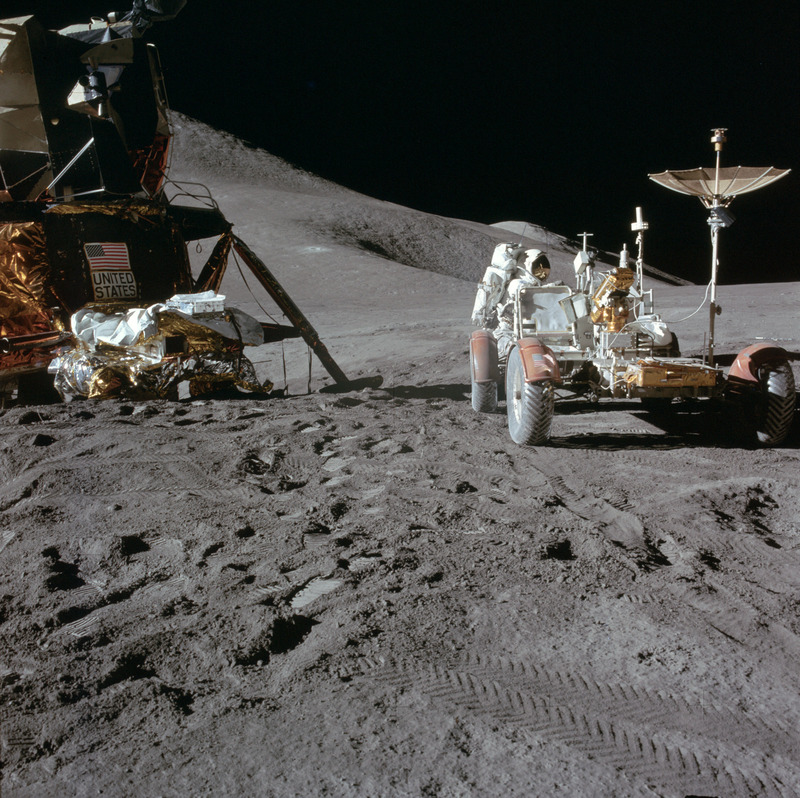 The first lunar rover was used for extensive reconnaissance. Within 67 hours the crew carried out three EVAs, spending 18.5 hours in total away from the LM. A new 500mm lens, camera and accessories were used, which have provided photographic opportunities not available to previous missions. Lift off from the lunar surface was on August 2, 1971 and the astronauts returned to Earth on August 7. Fig. 5. 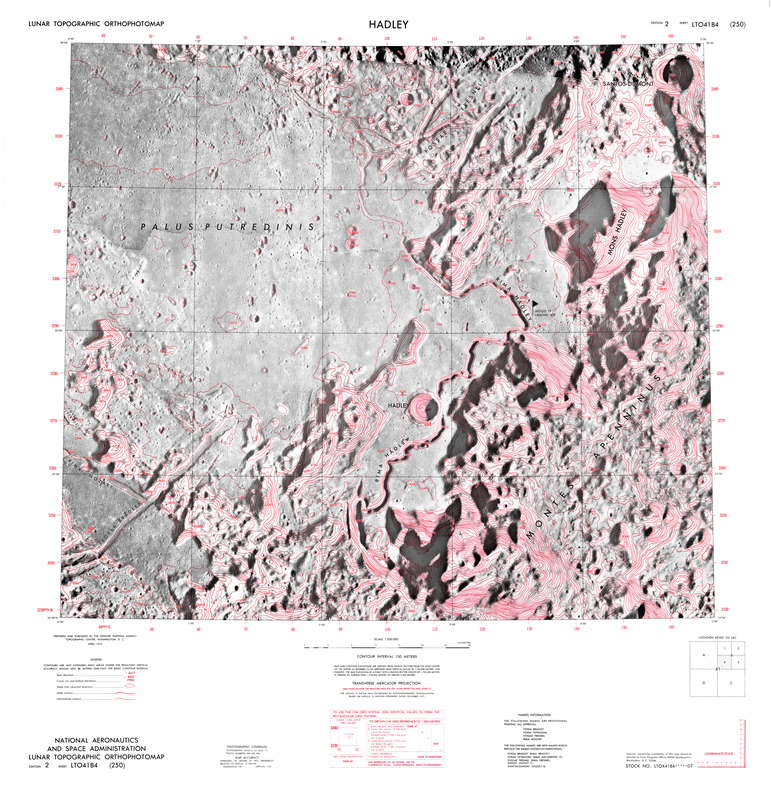 Topographic map of the Apollo 15 landing site. 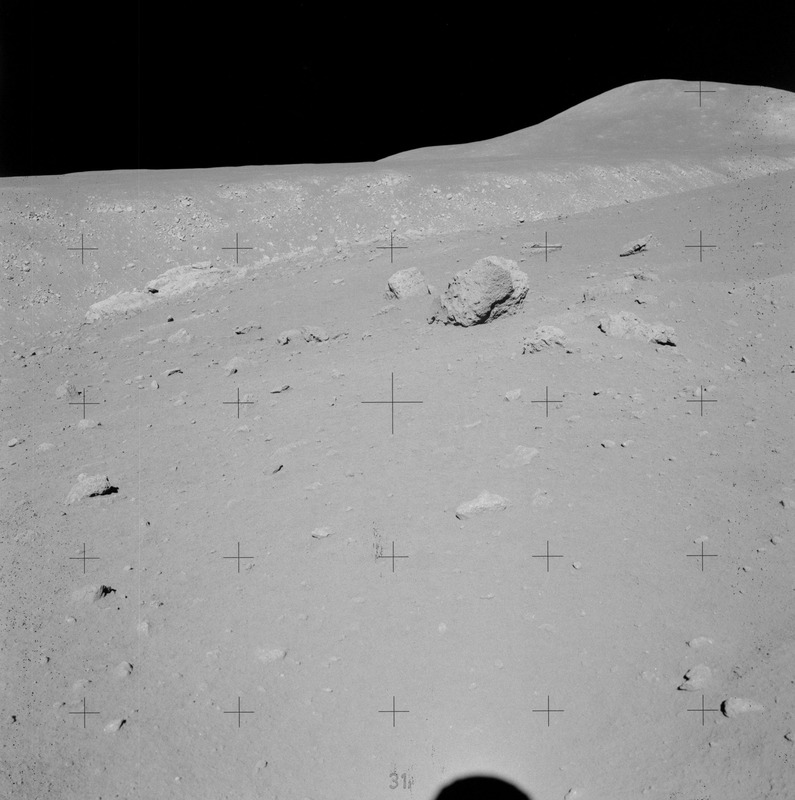 A series of Apollo 15 photographs will be considered and stereoscopic parallax or apparent change in the relative positions of objects will be analysed. The first series. Astronaut Dave takes a few panorama images in EVA-1 near the LM, AS15-86-11601 and AS15-86-11602. Fig. 6. The LM with Jim standing at the rear of the rover; the Apennine front and the crater St. George are located in the background. The distance from the camera to the lunar module and rover is about 10 metres, and the Apennines and the crater should be 4-8 kms away. A rectangle marks the sections of the photographs which were deducted for parallax examination and separation of 3D objects from any 2D objects. Fig. 7. The subtraction of the two photos after the transformations of scaling, rotation, and distortion is shown on the left. The right image shows the parallax achieved after merging the two frames. Nearby objects: the LM, the rover, and astronaut Jim are shifting relative to each other. The Apennines and the crater St. George are also moving as a whole. (Moreover, the shadow is changing on the mountains and the crater.) This finding indicates that it is less than 300 metres to the background (the ‘mountains’) instead of 5 kilometres! Therefore, with such a small alteration to the camera position in Dave's hands (several tens of centimetres), the mountains should not move, they should remain static (zero parallax). 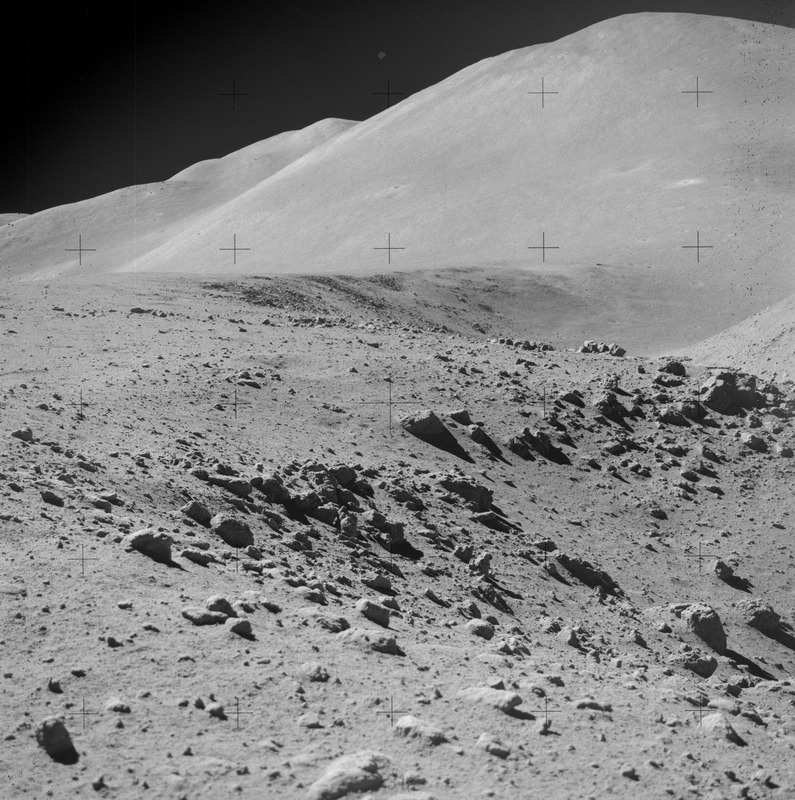 In addition, the Apollo 15 stereoscopic photos feature a clear separation line between the ‘mountains’ and the foreground. Based on the distance between the camera and rover, the distance to the panorama of the ‘lunar’ scape cannot be more than 150 metres. Conclusion: It is very probable that these images were taken on Earth in a studio stage. The second series. Jim is doing some panoramic photography (Fig. 8). The distance from his camera to the LM is approximately 40 m. Jim's ALSEP Pan at the end of EVA-2. Fig. 8. On the left Dave collects samples; Mount Hadley; LM in the centre; behind the LM the sun is shining into the camera and the Apennines are in the distance – over 35 kms; the Apennines and the crater St. George are on the right at a distance of 5-8 kms. The two images with a view of Mount Hadley were selected from the Panorama (distance is about 30 kms, the height more than 2.5 kms) AS15-87-11849 and AS15-87-11850. Fig. 9. Note the numerous boot prints left by Dave and Jim. Rectangles highlight the selected areas selected for parallax examination. Fig. 10. The subtraction of two images after scaling, rotation, and distortion is shown on the left. The stereoscopic image after merging two images is on the right. Despite a slight offset of the camera, the mountains are moving, which contradicts the condition of distant mountains. If the image subtraction criteria are changed, the most darkened background condition is replaced with the most darkened front area. Fig. 11. The subtraction of the front parts of the two images is on the left. The parallax resulting from the two merged images is on the right. This image was obtained by the subtraction of two photos taken with a camera shift of not more than 20 cms. Transformations of scale, rotation, reverse distortion, perspective, shift and the convergence of the two images into a stereoscopic image were applied. An error estimate is now performed. Assuming that this is a real lunarscape, then the distance from the astronauts to the lunar horizon should be 1.5 kms and the distance to the objects in the background, such as the foot and summit of Mount Hadley, is 20-35 kms. The offset of 100 sampled pixels below the horizon is calculated – the AB line, obtaining an average shift ± a pixels (depending on the image resolution). The shift magnitude obeys Gaussian distribution, meaning this is noise. A sample of 50 points is selected above the line (AB), i.e. objects located at a distance of 20-35 kms. Giving an offset value of (10-50)a pixels. The shift direction has a vector and is not subject to Gaussian distribution. Moreover, the higher a dot the greater value of the shift – at the foot it is 10a, at the top 50a pixels. It is logical to assume that if any lunar objects at the interval [0.01; 1.5] kms are static, the noise amounts to ± a, the parallax is zero, then for more distant objects at the interval [20; 35] kms, the parallax is likewise zero with the same value of noise, i.e. the shift is ± a pixels and the shift value obeys a Gaussian distribution. However, the results indicate otherwise. Objects above the (AB) line are moving synchronously with increase in shift depending on the height above the horizon. Conclusion: Mount Hadley moves and ‘bows’. The wrong initial assumption was probably made that this is a real lunarscape. As this research demonstrates, this setting must be a totally artificial panorama, several tens of metres in depth with a mock ‘Hadley’ in the background, moving horizontally and vertically to create an illusion of remoteness and of perspective. A series of Apollo 15 images are now examined near Rima Hadley for the presence of stereoscopic parallax. Rima Hadley measures in length at least 135 kms, with an average width ~1.2 and average depth ~370 m (from Greeley 1971 – quoted in F. Leverington, 2008). The third series. Dave and Jim make a few trips in the rover to Rima Hadley (Fig. 12) to collect samples. One of the panoramas comprises photos from AS15-82-11165 to AS15-84-11284. Fig. 12. Jim is holding the camera. Rima Hadley is in the foreground. Dave is collecting samples near the rover. Mount Hadley is in the background. The sun is shining into the camera in the centre. The Apennines are over 35 kms away. Apennines Front and the crater St. George are on the left. In two panorama frames is the bottom of Rima Hadley, which extends to Apennines Front and the crater St. George. The distance from the camera to Rima edge is about 5 m, to the Apennines and the crater is 4-8 kms. The frames are taken with a shift of no more than a few tens of centimetres. AS15-82-11178 and AS15-82-11179. Fig. 13. The view of Rima Hadley, Apennines Front and the crater St. George. Rectangles mark the sections used for parallax examination. Fig. 14. The foreground subtraction of the two images after scaling, rotation, distortion, shift and perspective is on the left. On the right is the resulting parallax obtained after merging the two frames. Fig. 15. Landscape and Traverse map of Apollo 15 landing site by NASA artist (showing stations 1-14). Images AS15-85-11423 and AS15-85-11424 were selected, taken at station 2 with Rima Hadley observation. Fig. 16. Images AS15-85-11423 and AS15-85-11424 station 2 with a view of Rima Hadley. Photo camera stereobase is not more than 0.5m. Fig. 17. Lunar Topophotomap of Rima Hadley, Apollo 15. Green dot marks the photo sessions site. The topophotomap (Fig. 17) shows that the opposite slope is over 1 km away, the depth is 300 metres, and it is 7 kms to the turn on Rima Hadley brow (green arrow, added July 2017). It is impossible to excavate an artificial canyon of similar size. Therefore, if fakery was involved, the opposite slope would have to be ‘painted’ or have a length of several tens of metres, simulating a lunar landscape. On the other hand, if the photographs are genuine, the parallax analysis will show that the distances correspond to the actual lunar surroundings, confirming the NASA record. For this parallax we apply the next set of transformations: optical zoom, rotation, distortion, perspective, shift in x and y directions to the image as a whole. The requirement of maximum deduction of remote landscapes is imposed to extract horizontal stereoscopic effect. Fig. 18. A stereoscopic pair of images AS15-85-11423 and AS15-85-1142 with horizontal stereoscopic effect after applying image transformations. Stereoscopic parallax is clearly visible in Fig 18, and we can make a preliminary estimation of the distance to the opposite slope of Rima Hadley. The distance is 50 metres (recall that it should be at least 1 km according to the map). The distant background is shifting slightly, although the parallax must be zero, since according to the map it is about 20 kms to the mountains. In general, given that in the true lunar background remote objects should be located many kms away, it is impossible to achieve a zero stereoscopic parallax using only previously-mentioned image transformations – confirmed by converging dozens of pairs of Apollo lunar surface images (as well as numerous efforts by other researchers). This strongly suggests that the distance to remote objects in the Apollo photographs which should be many miles/kms is indeed not so. These images are a simulation of being on the Moon. How were these fake Apollo lunar surface images taken? Due to incomplete convergence of remote background imagery a parallax error at the foreground of stereoscopic images is revealed. The relative error is a ratio of the foreground object’s shift in relation to the background object’s shift. The remote terrain in a stereoscopic pair of images can be converged precisely with each other. To do so it is necessary to go beyond the optical transformations applied to the image as a whole and introduce digital distortion to the sections of the image. This method can determine the nature of simulation of any background 'land'scape i.e. build a distortion grid and inspect it. Obviously, if the distortion grid has a curved surface, then it corresponds to projection at the rear onto a circular panorama screen, creating a simulation of a remote background scape on the projection screen. Instead of taking pictures in a remote lunarscape the ‘astronauts’ take pictures of a foreground with the background projected onto a screen. The radius of the circular panorama can be roughly estimated by a distortion grid. Fig. 19 below shows the distortion grid. A million pixels were involved in the transformation of these two images. In mathematical terms this is a system of a million equations solved with sub pixel accuracy. Fig. 19. Digital distortion grid of background objects in AS15-85-11423 after optical transformations converging with AS15-85-11424. A precise, curved concave transformation applied to the megabit pixels image confirms the fact that a ‘lunar’ scape was projected onto a forward-tilted, slightly convex panorama background screen. Any other technique fails to replicate the nature of the remote 'land'scape simultaneously for a million pixels of the image. Fig. 20. Illustrates the logic and simplicity of a simulated Apollo lunar surface panorama. The grid represents the projection screen which surrounded the Apollo simulation studio. Below is the final result of the transformation (optical transformations and the circular panorama are already taken into account). Fig. 21. Rima Hadley view. 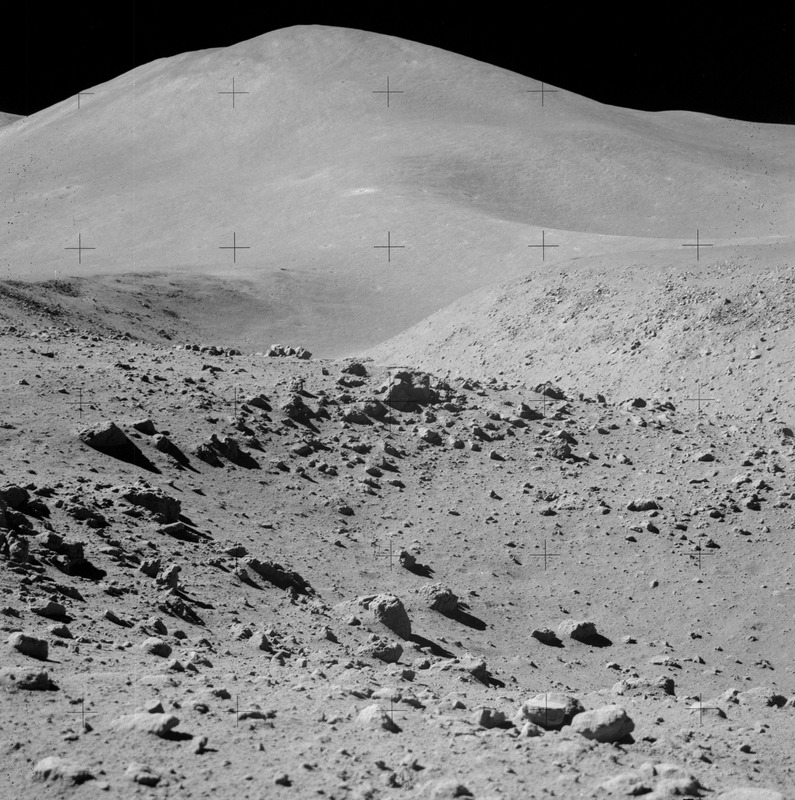 Apollo 15 stereoscopic photographs AS15-85-11423 and AS15-85-11424 after image transformation and digital non-linear distortion of the distant landscape. Distances to the image elements are specified in metres with an accuracy of 1%, 2%, 15%, 30% and 45% of distances 3, 11, 20, 40 and 60 metres respectively. According to the map the distance to the opposite slope of Rima Hadley should be about 1,000-1,200 metres. The parallax of the distant background is zero. In Fig. 21 we can see that the distance to the opposite slope of Rima Hadley is only 40 metres, while according to NASA's map it should be nearer to 1,000-1,200 metres. The difference is more than one of magnitude! This finding is seriously at odds with the official Apollo 15 record. A scale stereoscopic effect was considered for AS15-85-11423 and AS15-85-11424 along the z axis. For example a photographer takes a photograph in one position, then moves closer to, or further from the subject and takes another photograph. Fig. 22. A stereoscopic pair of images AS15-85-11423 and AS15-85-11424 with scale stereoscopic effect after transformations: 1) applying transformations: scaling, rotation, distortion, perspective, shift, and offset in x and y to the image as a whole; 2) digital distortion of the distant background terrain; 3) maximum subtraction of a distant background terrain, and 4) acquisition of scale stereoscopic effect. Distances to the image features in metres are specified with 60% accuracy. Scale stereoscopic parallax is clearly visible in Fig. 22, which is used to estimate the distance to the opposite slope of Rima Hadley. The distance is about 40 metres. The scale stereoscopic effect also points to fakery of the genuine Rima Hadley on the Moon. To verify the possible presence of a circular panorama background screen, another pair of Apollo 15 lunar surface images AS15-85-11424 and AS15-85-11449 with a view of the Rima Hadley taken at station 2 are examined. Fig. 23. AS15-85-11424 and AS15-85-11449 with a view of Rima Hadley taken at station 2. Below is a digital distortion grid on the distant background landscape present in images AS15-85-11424 and AS15-85-11449. A million pixels of the two images are converged with sub pixel accuracy. Fig. 24. Distortion grid of the distant background 'land'scape in AS15-85-11424 and AS15-85-11449. This confirms the previous finding that the ‘lunar’ mountain backscape was projected onto a forward-tilted, slightly convex, circular panorama background screen. Fig. 25. A stereoscopic pair of AS15-85-11424 and AS15-85-11449; view of Rima Hadley after transformations and digital distortion of the distant background backscape. Distances to the features of the picture are specified in metres with errors of 15%, 45% and 95% for distances 20, 45 and 140 m respectively. According to the map the distance to the opposite slope of Rima Hadley is approximately 1,000-1,200 metres; to Rima Hadley bow is about 7 kms. From previous calculations the distance is known to the foreground rocks at the bottom of Rima Hadley. Based on parallax it is possible to estimate the distances to the other objects as indicated in Fig. 25. Obviously errors are accumulative, the sum of any distance errors to the foreground rocks at the bottom of Rima Hadley as well as any errors in determining the shift of other features of the image – in this case 15%. A scale stereoscopic effect was also obtained for AS15-85-11424 and AS15-85-11449 along the z axis when the camera was moved nearer to the object. Fig. 26. A stereopair of images AS15-85-11424 and AS15-85-11449 with scale stereoscopic effect after transformations of: 1) scaling, rotation, distortion, perspective shift and offset in x and y to the image as a whole; 2) maximum subtraction of the remote landscape; 3) obtaining a scale stereoscopic effect. Specified distance to the elements of image in metres with an error not more than 85%. The scale stereoscopic parallax is clearly visible in Fig. 26. Using distances determined from the scale parallax, the distance can be estimated to the opposite slope and to Rima Hadley bow. The distance to the opposite slope of Rima Hadley is no more than 40 metres, and the distance to the Rima Hadley bow does not exceed 140 metres. According to the topographic map, distances to these locations are more than 1 km to the slope and to Rima Hadley bow it is about 7 kms. Here again, there are serious anomalies in this Apollo record. From a scale stereoscopic effect it is possible to estimate the distance to Rima Hadley bow and to the background projection screen. Fig. 27. A stereopair of images AS15-85-11424 and AS15-85-11449 with a scale stereoscopic effect after transformations and application of the distortion grid for a distant landscape. The relative error in distances is no more than 60%. Based on the stereoscopic result, the calculated distance to the mountains on the horizon is 140 metres (accuracy 60%). According to the map it should be more than 20 kms. The difference in distance is more than 100 times! These serious errors in the Apollo 15 photographic record indicate that these images were undoubtedly faked. The study of stereoscopic effect in photographs AS15-85-11423, AS15-85-11424 and AS15-85-11449 shows that these images do not contain distant objects farther than a few hundred metres away. The distance to the opposite slope of "Rima Hadley" is about 40 metres (should be 1,000-1,200 metres), to Rima Hadley bow is about 90 metres (based on the topographic map is about 7 kms) and to the mountains it is 100-140 metres (should be nearer to 20 kms based on the lunar geography). The error in calculation of these distances is 15-60%. Contradictions in the photographic record of the Apollo program point to the simulated nature of the lunarscape: creation of an artificial canyon, 40 metres wide and 90 metres long, simulating Rima Hadley with help of a rear background screen, depicting a distant lunarscape. Was there a way to simulate the remote lunar surface on a projection screen for any other Apollo 15 lunar surface photographs? More Apollo 15 images are considered from the NASA record with distant lunarscapes. In Fig. 7 after optical transformations, all the foreground objects: the LM, the rover, and astronaut Jim move relative to each other. Any distant object such as the Apennines and the crater St. George also move as a whole. Shadows on the mountains and on the crater change as well. The separation line between the mountain and the foreground area is clearly visible. A rough estimate of the stereoscopic effect gives the distance to the background (mountains) as less than 300 metres. Instead of the 5 kms according to the Apollo record. To converge a remote lunarscape a distortion grid was superimposed onto the optically-transformed images AS15-86-11601 and AS15-86-11602. Fig. 28. A distortion grid of the distant backscape for the converged images AS15- 86-11601 and AS15- 86-11602 in the stereopair. Fig. 28 shows the distortion grid for converging AS15-86-11601 and AS15-86-11602 to obtain zero stereoscopic parallax. Recall that introducing a distortion grid is the method of going beyond the standard optical transformation – the system of creating equations for a one-million pixel image. Going beyond the laws of optics in converging two pictures into a stereopair questions the veracity of the image and results in a postulation that the lunarscape was faked. The regular curved repetitive distortion grid for other pairs of images indicates projection of the distant background mountains onto a rear screen positioned about 100 metres away with the ‘astronauts’ in the foreground. Fig. 29. Stereo image after combining two pictures AS15-86-11601 and AS15-86-11 602 for parallax study. Line AB is a horizon mark at the foot of the mountain, above which is a projection on the screen to simulate a lunar mountainscape. The contrast was increased and the brightness was reduced. Fig. 30. A distortion grid of the distant 'land'scape for converging two photographs AS15-87-11849 and AS15-87-11850 into a stereopair. Fig. 31. A stereopair of two images AS15-87-11849 and AS15-87-11850 to study the dynamics of the scene after application of optical transformations and imposing the distortion grid. Fig. 31 shows a stereopair of images AS15-87-11849 and AS15-87-11850 to study the dynamics of the lunarscape after application of optical transformations and imposing the distortion grid. Obviously the distortion grid is a method of going beyond optical alterations and is an indicator of simulation of the lunarscape and the lack of really distant objects that should be several kilometres away. The nature of simulation for a given pair of images is similar to the previous pairs of images. rotation, distortion, shift and perspective. Fig. 33. A distortion grid of the remote 'land'scape for converging photographs AS15-82-11178 and AS15-82-11179. Another pair of photographs taken at the station 9-11, AS15-82-11121 and AS15-82-11122 points up the fact that the image of the mountain and central part of the Rima Hadley was projected onto a background screen. Below is the final stereopair after optical transformations were applied and imposing the same distortion grid on the remote lunarscape as previously. Fig. 34. A stereopair AS15-82-11121 and AS15-82-11122 after optical transformations and overlaying a distortion grid on the remote landscape. Official distance to the slope of Rima is indicated as being not less than 1,500 metres and the value based on parallax – 50 metres (error not more than 60%). The distance to the opposite slope of the Rima Hadley is 50 metres. The foot of the mountain and the Apennines can be clearly seen. Undoubtedly, this is a projected image on to a screen taken by ‘astronauts’ (AS15-82-11121 and AS15-82-11122). The actual length of the Rima Hadley on the Moon is actually 135 kms, the width is about 1.2 kms, and the depth ~370 metres. Professor of University of California G. Schiller has noted: "To be successful, manipulation should remain invisible. The success of the manipulation is guaranteed when the manipulated believe that everything happens naturally and inevitably. In short, manipulation requires a false reality in which its presence will not be felt". Very often this false reality is amplified by the media. 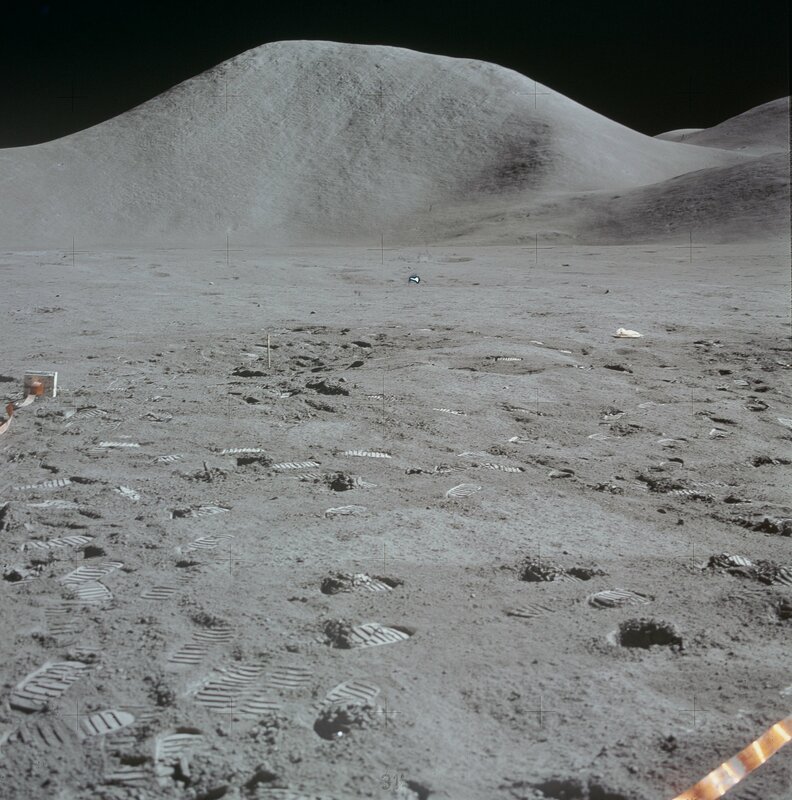 In the convergence of these Apollo 15 pictures, more than a million equations (the number of pixels in the images) were calculated obeying the laws of optics. In order to obtain a zero stereoscopic effect for a remote landscape, typical distortion grids were generated around the photographic session sites. 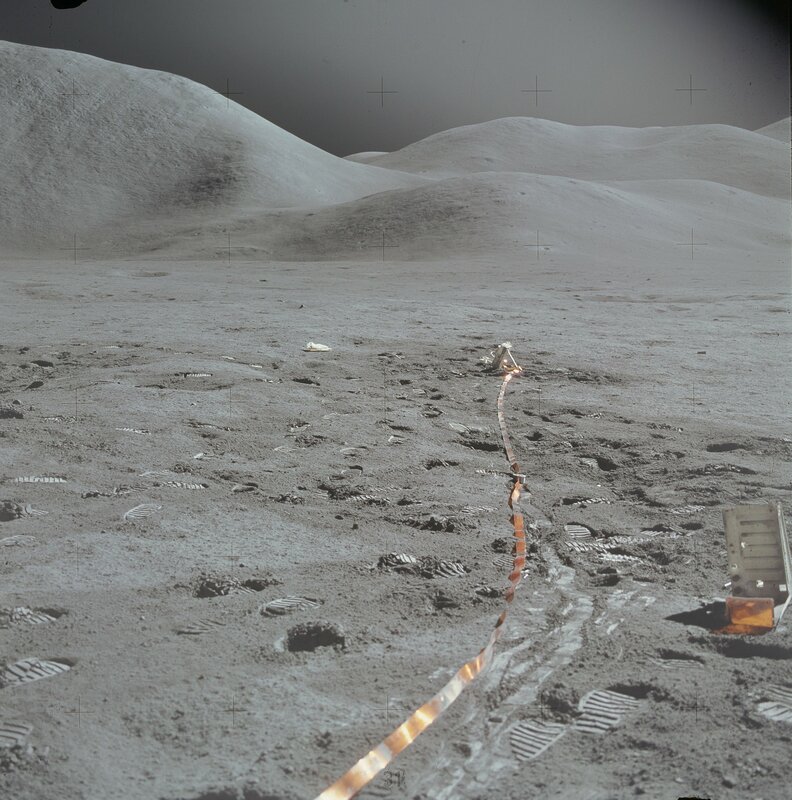 Numerous Apollo 15 photo examples indicate an identical distortion grid – a projection screen at the distance of 100-120 metres from the front of the studio stage. A serious falsification of the true lunarscape, in particular, an artificial trench 30-60 metres in width given for the lunar Rima Hadley which is actually 1,200 metres in width; the image of this remote lunarscape being projected onto the curved background screen; and ‘astronaut’ photographers taking pictures in front of it in a studio set. there is movement between nearby sections of the panorama relative to other sections. Thus, based on the above examples, this study concludes that the Apollo 15 photographic record does NOT depict real lunarscapes with distant backgrounds located more than a kilometre away from the camera. These pictures were, without doubt, taken in a studio set – up to 300 metres in size. A complex panorama mimicking the lunarscape shows degrees of movement, such as horizontal and vertical changes to give an impression of imaginary distance to the objects and perspective. From 1984 to 1993 Dr Oleg Oleynik graduated from the Physics and Technology Department (Phystech) of the Kharkov State University. He obtained a Master’s degree in physics in physical metallurgy. From 1993 to 1999 Oleynik was a senior engineer, scientific assistant, postgraduate student, and a Soros postgraduate student. In 1999 Oleg successfully graduated from the Phystech postgraduate school, obtained his Ph.D.c specializing in experimental nuclear physics and the physics of charged particle beams at the Physics and Technology Department of the Kharkov State University. This was followed by a preliminary defense of the thesis, with a positive review by D.S. V.T. Lazurik. After 1999 Oleg left the Phystech department to pursue an independent career. From 1999 to 2012 Oleg Oleynik organized non-state research on humanism on the Web, founded a School, a College, and a University with academic degrees. Two years have passed since the original publication of this article in Russia. During that time, NASA decided to create a series of stereo photographs for 3D red-cyan glasses (anaglyph images), superimposing overlapping parts of Apollo surface photos. Reports slip out now and then that some of the photos on NASA’s Web sites have been replaced by retouched counterparts. An article entitled "The method of correlative calculation of parallax and camouflage" was published (in Russian). I criticized the article stating that: "The merging of frames is carried out in the application for creating 360 degrees panoramas PTGui, which erases parallax, and eventually the distance to background objects artificially increases. Please double check the algorithm of the application". More here (In Russian). There was no answer from NASA. Instead, in the Russian Wikipedia, late 2009, the following paragraph was added (and removed on July 31, 2011) to The Moon Hoax article: "Also, analysis of the lunar surface images, taken during the missions shows that distance to background objects is indeed vast and cannot be achieved in a soundstage with trick photography", referring to "The method of correlative calculation of parallax and camouflage" publication. Any attempts to change or correct the information in Wikipedia, and to point out the serious errors in the Wikipedia article did not succeed, the moderator continued to erase the link.